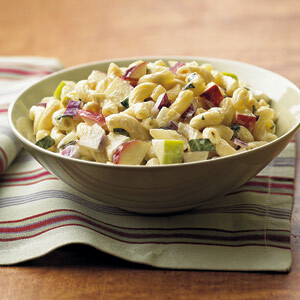 Celebrate the warm weather with this fresh Apple & Herb Pasta Salad that tastes fresh and tangy. This dish perfectly compliments grilled or BBQ meat and it's super filling, too. Cook pasta in boiling salted water according to package directions. Cool pasta 10 minutes. Stir together apples, onion, mayonnaise, basil, mint, sugar, sour cream, vinegar, lemon juice, and zest; toss with pasta. Season salad with salt and pepper; chill until ready to serve.